Wedding, Party, Exhibition, Trade Show Etc. 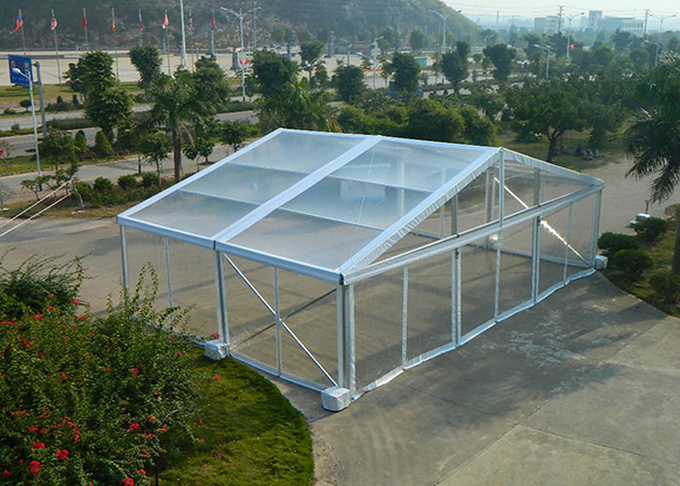 The width of the big outdoor canopy clear roof wedding party marquee tent is customized, its main frame is highly extruded aluminum alloy. 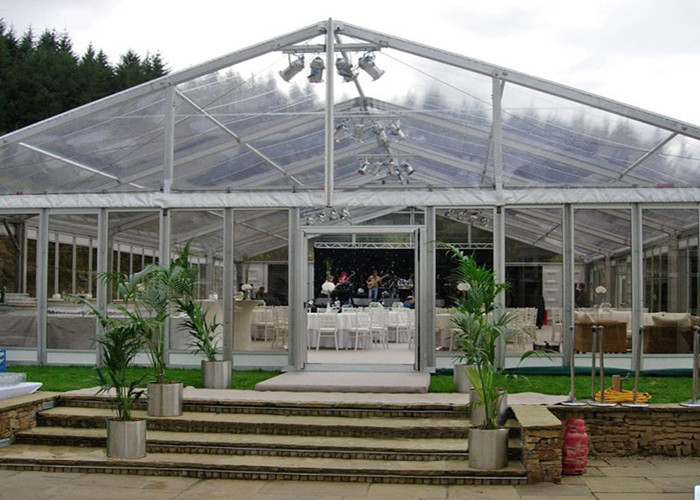 The connection part of the clear roof marquee party tent is hot dipped galvanized steel. The farric covers and side walls are clear PVC fabric, it also has many fuctions, such as fireproof, waterproof and sunproof. • Connecting Part: Well hot-dip galvanized steel parts. • Max allowed wind: 60-80km/hour (0.5kn/sqm). • Lifespan under well treatment: 15 years for main frame parts, 1 years for cover part. • Expansion screws: for concrete floor like cement. • Steel nails: for soft land and grass land. • Weight plate: for floors can't be damaged. • Rain gutters: rain gutters between two tents to protect from water or raining. • Other optional items: AC, chairs, tables, LED lighting, carpet, mobile toilet etc. 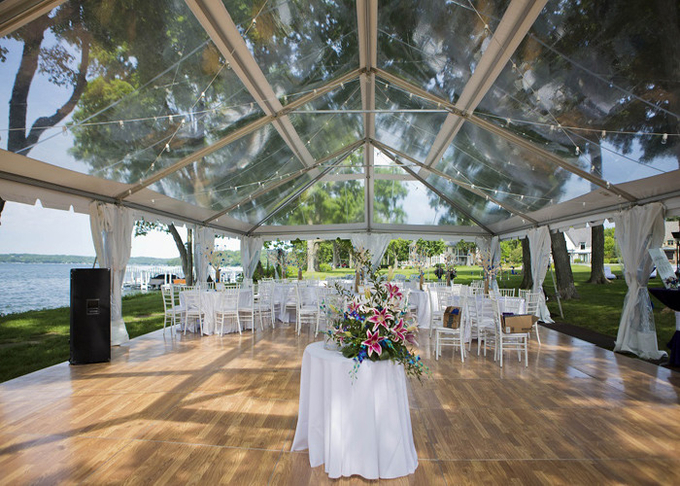 The clear style tent is very welcomed for outdoor wedding party ceremonies. It can give the customers great view for the outside sight seeings. Also it’s a nice image for the visitors from outside. But because the clear fabric is not as strong as traditional PVC, we strongly recommend customer to buy a traditional white PVC tent and at same time to buy an additional clear fabric as a replacement. • Compared to other types of tent, it is more nice looking in appearance. • Compared to other kinds of tent, it is much cheaper in cost. • You can increase or decrease the length freely. • Easy to dismantle and set up. • More environmental cause it can be quickly moved away after used.